Yours for consistent yoga practice for maximum benefit! Yoga at Home: Yoga Practice Gives You Time! Yours for gaining time with a consistent yoga practice! Yoga instructor, Ganga White has said, "yoga does't 'take time"-it gives time." I agree! For many people, however, the most daunting aspect of establishing an exercise regime including a yoga practice is carving out the time for it. When I check in with people who have bought my book, Yoga at Home: Gain Energy, Flexibility, and Serenity in 20-30 Minutes a Day, to see how their practice is going, a common reply is that when they do yoga, they feel more energetic and relaxed, but that they are still working on doing it regularly. It's "finding" the time that seems to elude them. However, in my humble opinion, saying you have to "find" time for yoga reinforces the notion that time is scarce. Granted, out 21st century lives appear increasingly hectic despite all the time-saving gadgets that we own and use. Many of us feel we're on a rapid, nonstop treadmill of activity that is hard to get off. But, the fact is that we just have to choose to step off the treadmill and take a breather. And, that breather can be our yoga practice. When you practice yoga daily for 20-30 minutes a day (or longer if you choose!) you will likely find, as I have, that yoga "gives" time. My yoga practice gives me more energy, clarity, and joy which in turns enables me to do all my activities more effectively and efficiently. The key, as I preach ad nauseum, is giving myself the gift of doing yoga daily. As Ganga White has also remarked, "Only when we take care of ourselves can we have more abundant energy to give to others and to our endeavors." So I say, go roll out your yoga mat right now and just see how your yoga practice can give you time! Beginners Yoga: Why Do Yoga Daily? I am getting close (finally) to finishing my beginners yoga book for non-athletes. I have sent chapters out to friends for their honest feedback - both in terms of content, style, and editorial corrections. One friend suggested that I not advise my readers that they do yoga 5-6 times a week because many people are too busy to fit that much practice in each week. Yes- many of us feel quite "busy." Often too busy to exercise...! The idea of having to do yoga daily seems unrealistic or expecting too much of the average person. Well, don't most (maybe not all...) people brush their teeth, shower, and get dressed daily? They would not consider skipping that routine except on occasion or maybe on a day they're staying at home - but, they do it daily most of the time because it's part of their lifestyle to maintain good hygiene and a decent appearance. You can apply the same philosophy to your yoga practice. I take a 5-10 second "commute" downstairs to my family room to do my 25-30 minute practice which enables me to stay slim, supple, and serene. I do this daily except for once a week when I allow myself to sleep in because of a late bedtime the previous night. Allocating half an hour to yoga a day is hardly a huge time commitment and the gains I experience in energy more than make up that time investment. Incorporating yoga as part of your "lifestyle." Yoga is not a quick fix and your practice should not be about "getting" in shape, but about creating an overall healthy approach to life. Our bodies were designed to move daily- not every few days. If you have a sedentary job like mine, daily yoga is a must. You're not going to convince me otherwise. It's a cliche, but true. Most people say they'd like to practice yoga or be active in another exercise regime, but they just don't have the time. Frankly, it's difficult for me to fathom not carving out at least 15-20 minutes in a given day to engage in some sort of physical activity. And, in my opinion, hatha yoga is one of the best ways to use that time. By being open minded, creative, and resourceful, honestly, I believe you can squeeze in your daily yoga practice if you make the commitment to do so. Below are a few suggestions I have adapted and used myself or read for carving out the time to do yoga poses. Keep a yoga mat by your bed so you can do the bow or cobra or backward arm clasp as soon as you roll out of bed in the morning or right before you go to sleep to create a more peaceful, deep sleep. Are you at your desk a lot in an office job? Take 3-5 minute mini breaks a few times a day to do neck rolls, arm lifts, or shoulder squeezes. If smokers can take their smoke breaks, surely you can take mini yoga breaks at your desk or in the ladies room. Keep yoga books around your home and maybe one at or near your desk at work to remind you to do stretches when you have a free moment here and there throughout the day. Of course, remember, that some exercises should not be done on a full stomach or your risk a cramp. At work, I mainly do side bends, the arm and leg stretch, and the eagle pose in the ladies room plus breathing techniques and neck rolls at my desk. Squeezing in yoga practice throughout the day is a tremendous way to easily gain maximum benefits from your daily yoga practice. Just enjoy the process and keep your eyes open for opportunities to squeeze in another beneficial pose. Simple Savvy Steps to Yoga Success: Why Mornings Are Best for Me! The past week has had its challenges for me in terms of family issues. Thank goodness for my hatha yoga practice which definitely helps alleviate the stress! Last night, because I was discussing some of these "issues" with a good buddy, I went to bed late. Way too late. I felt tired this morning when that 4 a.m. alarm sounded. And, then I remembered-- I can do my rebounding and hatha yoga this afternoon as I'd be leaving work early for a meeting with my son's teachers! My head hit the pillow once more for another 45 minutes or so. The morning went okay except I noticed fatigue setting in from time to time. I ate my (healthy) lunch and 30 minutes later, I was crashing....! Gees, what is going on - I am used to lots of energy!? After my school meeting I ran some errands and then went to my rec room for my personal exercise time. I rebounded for 25 minutes and then laid out the mat for another 25 minutes of yoga. And it finally hit me - especially as I felt so relaxed and rejuvenated after my yoga poses. For me, at least, yoga in the morning essentially sets the tone for and boosts my whole day! I was slumping today because I had switched to an afternoon exercise session. I hadn't really woken up this morning! I felt energized only the latter part of the day. That's why morning yoga practice is best - at least for me. I get to enjoy energy throughout the day! Wisdom of the Day: "While access to a good teacher is useful, yoga is essentially a process of self-observation, development- and- realization, so the most important thing is for you to practice yoga for yourself, by yourself, with confidence." ~Tara Fraser, The Easy Yoga Work Book. It can be a challenge squeezing your home hatha yoga practice into your daily schedule without feeling harried. My daily commute from my door step to my office in Southwest Washington, DC is just about one hour. Consequently, my mornings can feel hectic after waking up, doing yoga, doing some aerobics, taking a shower, dropping my son off to school, and heading to work. To offset the harried morning pace AND include a calm, serene, and focused home yoga practice session I use a timer. This might seem sacrilegious, but it really isn't. On week day mornings I use a timer for my 25 minutes of yoga practice. (on weekends I set it for 30-35 minutes). I get down on my mat, turn on the timer, and proceed with my relaxing practice. No need to constantly look up at the clock or at my watch. Now what happens if the timer goes off in the middle of the pose? This happens infrequently. If it does, I just calmly complete the pose and go into the Savasana (complete relaxation) pose for at least 1-2 minutes and then I am on my way. When I set the timer for 25 minutes on a weekday, I include a 5-minute time buffer to allow me to complete a final pose and to rest in the Savasana at least briefly after the session. Using a timer -any simple, inexpensive kitchen countdown timer will do - although nowadays you can even find timers made specially for yoga with dual timing functions (one to count your total practice time; the other to time each pose - seems complicated to me!). Using a timer allows me to totally put my heart and focus into my practice. Try it! As I have said so often and most yoga teachers agree, consistent daily practice is vital to reaping the maximum benefits from hatha yoga - increased energy, vitality, clarity, serenity, fitness...and on and on. 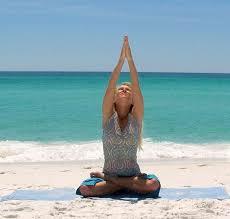 Hatha yoga done daily attunes you to your body, mind, and spirit. When I began yoga as a teenager, I performed the poses each night before bedtime in my mother's living room with Tchaikovsky's Sleeping Beauty or the Nutcracker playing softly in the background. I occasionally do yoga poses at night these days, but it's usually when I am mentally preoccupied with something and need to relax to fall asleep. Nighttime poses supplement my core daily regime that occurs every morning at the crack of dawn. Yoga done so early in the morning not only helps to awaken me from a night's slumber, but guarantees that I am not interrupted or sidetracked. No one phones me at 5 a.m. No one knocks on my door to socialize or go to Starbucks (Starbucks doesn't open until 5:30 a.m. anyway - at least in my neighborhood at that time), and my son doesn't have sports matches or after school activities requiring my participation. At 5 a.m. it is just easier for me to keep the daily practice commitment. Once you have kept your commitment for several weeks, the daily time spent on your mat becomes ingrained in your psyche. Just as you would not consider (I hope!) not brushing your teeth every morning, soon a day without yoga will make you feel incomplete. You will notice that you're missing a pleasurable, relaxing activity. Early mornings work best for me because of my particular work and family schedule. For you it may be the evening or the lunch hour (if you work at home or have a spot to do practice yoga at lunch in your workplace). Be honest with yourself. What time of the day can you consistently set aside as to do your yoga practice without interruptions or distractions? Choose it wisely. Until you truly have it ingrained as part of your daily regime, write it down in your daily calendar as an appointment, just as you would with the dentist or doctor for a checkup. Commit to a set practice time whether it's 15 minutes or 30 minutes. It may seem challenging at the beginning, but as you start feeling more fit, more serene, more toned and flexible, you won't want to miss your yoga mat time very often! Yoga Quotation of the Day: "When you feel how much your yoga practice does for you, you'll realize that it's a good thing to do every day because you'll have a happier life. "~Rodney Yee, renowned yoga instructor. Sticking to a daily routine of yoga practice doesn't seem easy. Many people complain, "it so difficult to SQUEEZE in the time, day after day for yoga practice. Our life is too hectic, the job, the commute, our children, our spouse, our volunteer activities, cleaning the house, mowing the lawn. All these responsibilities take so much of my time! How, can we fit it in? " In the beginning, especially if you're out of shape, keeping the commitment can be a challenge. However, gentle hatha yoga is probably inherently easier than other disciplines to start and maintain. At least this was my experience. If you start slowly and progress incrementally, you won't suffer from sore muscles which can cause people to back out of their daily commitment. Creating a nice ambiance with candles or relaxing music can remind you that you are giving yourself a GIFT. Don't you deserve to give yourself the gift of 15-30 minutes of relaxation and toning every day? Aren't you worth it? Gentle hatha yoga truly allows you to release what some poet called "the imprisoned splendor within." As a holistic technique, yoga maintains or restore the inherent physical well-being that is your birthright. If you remember this, you should find it easier to practice regularly. Simple Savvy Steps for Yoga Success: Your Daily Practice - Just Do It! Consistent, daily (okay - you can have a day or two off each week) practice of hatha yoga truly is important to reap its wondrous results. Oddly, even though our modern lifestyle is replete with technological advances and conveniences to minimize our chores (for example, you toss your clothes into the washer and then throw them into the dryer - not too many people walk to the local creek to spend hours beating the dirt out of their clothes on a nearby rock), people complain they're too busy to squeeze in time for yoga or any other physical routine. Yes, we're busy. But, if you want to really feel spectacular every day (or virtually so), daily yoga practice is vital. Just before turning 25 (and please, don't try to guess how many years ago that was! ), I made a commitment to exercise at least 5 to 6 times a week. At that time I was doing only a little yoga - my exercise staple became jogging -- a boyfriend had just dumped me, and yes - I wanted to show him! But, no, more importantly, I just KNEW daily exercise was essential for staying in shape, forever, or as close to forever as I could get! Our modern, sedentary lifestyle often leads to rigid, untoned, bodies by our earlier 20s, if we don't regularly MOVE and STRETCH. Granted, occasional emergencies and unexpected events can throw us off kilter and cause us to miss a yoga practice. Most days, though, we have our general routine of work, play, and rest. I don't buy into people telling me that they can't carve out at least 30 minutes somewhere in their schedule to devote to yoga or any other exercise. If you just had a baby (or an injury or surgery), you're excused for a couple of months. Newborns tend to lead to complete exhaustion from their feedings every two hours. But, after that rough stage is over, resume at least 15-20 minutes of daily exercise. Just DE-CIDE. I once heard a motivational speaker say that "decision means to cut off any other options." If necessary, tell a friend that you will give him or her a $100 bill or otherwise incur some creative penalty if you don't stick to a daily yoga practice for at least 21-30 days - Then, as the Nike cliche says, "Just Do It." It works, if you work it.